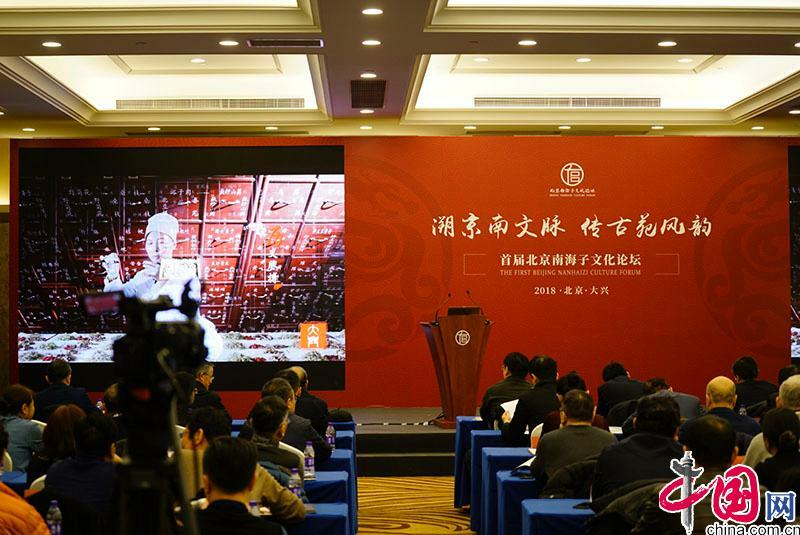 On December 8, the first Beijing Nanhaizi Cultural Forum was held in Daxing, Beijing. Well-known industry experts gathered together to discuss the inheritance and development of the Nanhaizi culture. It was announced at the forum that a philosophical and poetic film entitled "Snow Falls on Deshou Temple" based on the stories of the temple would start production. A special exhibition called The History of a Royal Garden also opened. It chronicles the visits to and stays at the garden by the emperors of Liao (907-1125), Jin (1122-1234), Yuan (1271-1368), Ming (1368-1644), and Qing (1636-1912) dynasties. 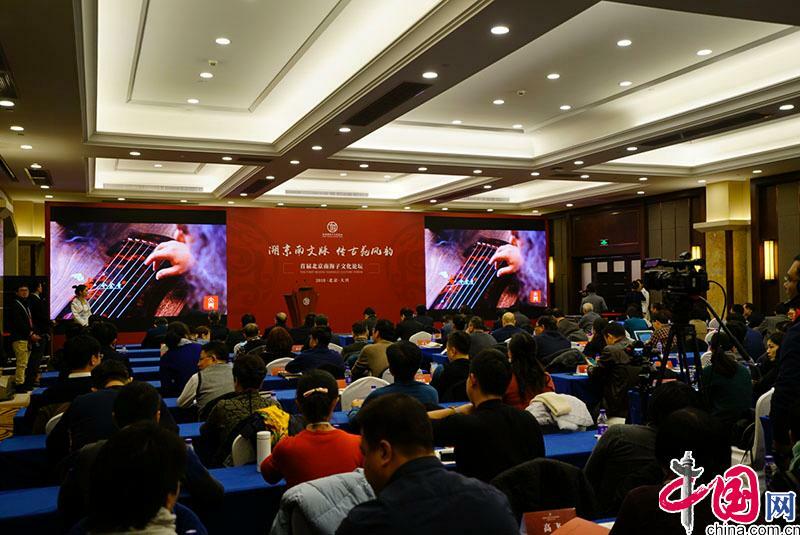 On December 8, the first Beijing Nanhaizi Cultural Forum was held in Daxing, Beijing. 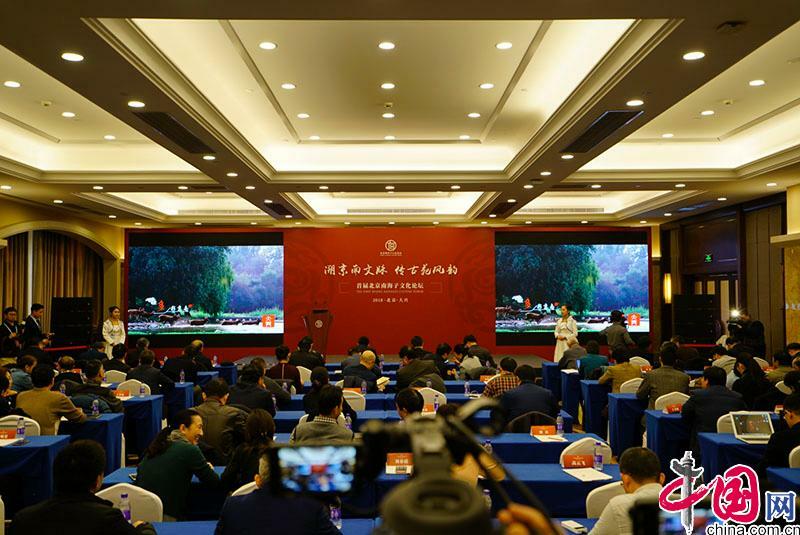 The forum, which focuses on the more rigorous and systematic academic discussions on the development of the Nanhaizi culture, is the first high-end academic forum in China specifically held for the research of the Nanhaizi culture. The academic discussions involve the rich traditions of the Nanhaizi Royal Garden, the clarification of its status, and the direction of future development. The experts trace the culture of southern Beijing and promote the traditional charm of an ancient royal garden. Daxing, Beijing is taking advantage of the opportunity to promote the development of the Nanhaizi culture and create an appealing brand for the Nanhaizi Royal Garden. The forum invited leading experts, including Dai Yi, director of the National Committee of the Compilation of Qing History and professor of the Institute of Qing History (IQH) of the Renmin University of China, Zhu Chengru, deputy director of the National Committee of the Compilation of Qing History, Wang Qiheng, professor of the School of Architecture of Tianjin University and a researcher of the royal gardens of the Qing Dynasty. They conduct a systematic examination of the history and culture of Nanhaizi, improve the study of historical culture in southern Beijing, identify the cultural meanings of the ancient capital, and promote the creative transformation and innovative development of the traditional culture of the Chinese nation. According to Dai Yi, Nanhaizi was a very important place in the Qing Dynasty. Especially, before the establishment of the Summer Resort and the Three Hills and Five Gardens (Fragrance Hill, Jade Spring Hill, Longevity Hill, Garden of Tranquility and Pleasure, Garden of Tranquility and Brightness, Garden of Clear Ripples, Garden of Everlasting Spring, and Old Summer Palace), Nanhaizi was the political and cultural center of the early Qing Dynasty. Emperor Shunzhi, and Emperor Kangxi in the early years of his reign, often stayed at Nanhaizi and governed the country from there. The Nanhaizi culture is a result of diversified cultures blending with each other and of the exchanges, through peace and war, between nomadic people and agricultural people. Nanhaizi was a place where the Chinese nation experienced integration. Wang Qiheng said that Beijing has two ecologically important regions, one in the northwestern suburbs and the other in Nanhaizi. Liangshui River and Fenghe River directly originate from Nanhaizi, which is a key part of Beijing’s water ecology and water system and plays a critical role in transportation and water conservancy systems in North China. The development of the Nanhaizi culture should reflect the role of its historical ecology, its sustainable development, and its impact on global culture. At the forum, Zhu Chengru also shared its professional academic thoughts, saying that Nanhaizi, a cultural heritage of the Kangxi-Qianlong Flourishing Age, played an extremely important role in the Qing Dynasty. The Nanhaizi area was the auxiliary political center at that time where the Qing emperors governed the country. Emperors Shunzhi, Kangxi, and Qianlong trained troops and handled government affairs there. They built houses there in which they studied and met their ministers. Particularly, Emperor Qianlong even built the Tuanhe Palace, a splendid and large compound. The Nanhaizi area was also a military center for large military parades and drills. As a martial people, the Manchus routinely rode horses and practiced archery. In Nanhaizi were built training grounds and parade grounds, where Emperor Qianlong held large-scale military parades, demonstrating the prominent status of the area. Well-known experts gathered in Daxing to propose ideas for the heritage and development of the Nanhaizi culture. With the convening of the first Beijing Nanhaizi Cultural Forum, a special exhibition called The History of a Royal Garden also opened in Daxing District. The exhibition chronicles the history and culture of Nanhaizi. Pictures, objects, and videos taking the forms of graphic and textual explanations, microscopic carvings, and virtual reality (VR) experiences about what the emperors of Liao, Jin, Yuan, Ming and Qing dynasties did in Nanhaizi chronicle the historical changes of Nanhaizi, including travels, hunting, parades, drills, government affairs, and ecological security. The Full Map of Nanyuan of the late Qing Dynasty and The Fengquan Liangshui River Map of the Tongzhi period (1862-1874) of the Qing Dynasty from the collection of National Library of China (NLC) and The Administrative Map of Beijing-Hangzhou Grand Canal of the Kangxi period (1662-1722) from the collection of Zhejiang Provincial Museum were put on exhibition for the first time. The Full Map of Nanyuan shows the territorial limits and the size of Nanhaizi in its heyday. The Fengquan Liangshui River Map illustrates the relationship between the Nanhaizi wetland water system and the Grand Canal. The Administrative Map of Beijing-Hangzhou Grand Canal demonstrates the relationship of Nanhaizi with the city of Beijing, Yongding River, and the Grand Canal. 3D and VR technologies are used to showcase the restored landscapes of a large number of historical buildings such as the Tuanhe Palace, the largest one in Nanhaizi, and the Deshou Temple in the early Qing Dynasty which witnessed the integration of the Chinese people. Hand-made microscopic carvings of the Deshou Temple, government office buildings, palaces, and the Nanhongmen Palace vividly reproduce the ancient gardens of Nanhaizi in its prime time. At the forum was announced the start of the preparation for shooting the film entitled "Snow Falls on Deshou Temple." Deshou Temple, located at the southern gateway to the capital city of Beijing, is a cultural landmark that has left a deep imprint on the Chinese history. In the early years of the Qing Dynasty, Emperor Shunzhi met the Fifth Dalai Lama near the location of Deshou Temple; and Emperor Qianlong met the Sixth Panchen Lama at Deshou Temple in Nanhaizi. These two historical meetings were milestones in the history of the relationship between the Central Government of the Qing Dynasty and the Tibet region. The murals, sanctioned gold seals, and books, still found today in the collections of the Potala Palace in Tibet, all bear witness to history. In June 2018, under the promotion of the Publicity Department of the CPC Daxing District Committee, the film of Snow Falls on Deshou Temple was launched. A group of well-known leading screenwriters, planners and producers, after in-depth research and conception, have finished creating the scripts for the film. On November 2, a seminar on the script creation for the film was held at the Institute of Qing History (IQH) of the Renmin University of China. The experts at the meeting agreed that the film has a special meaning because it is a vivid interpretation and embodiment of national unity and patriotism. Snow Falls on Deshou Temple is a philosophical and poetic film based on the stories around the temple, a historical and cultural story of the relationship of the Central Government of the Qing Dynasty with the Tibetan local government. The two meetings between the Qing Emperors and Fifth Dalai Lama and Sixth Panchen Lama were part of the historical legend and memory of the glorious Chinese history, which inspire the Chinese people on her road to national rejuvenation. The first Beijing Nanhaizi Cultural Forum was held in Daxing, Beijing. Well-known industry experts gathered together to discuss the inheritance and development of the Nanhaizi culture.